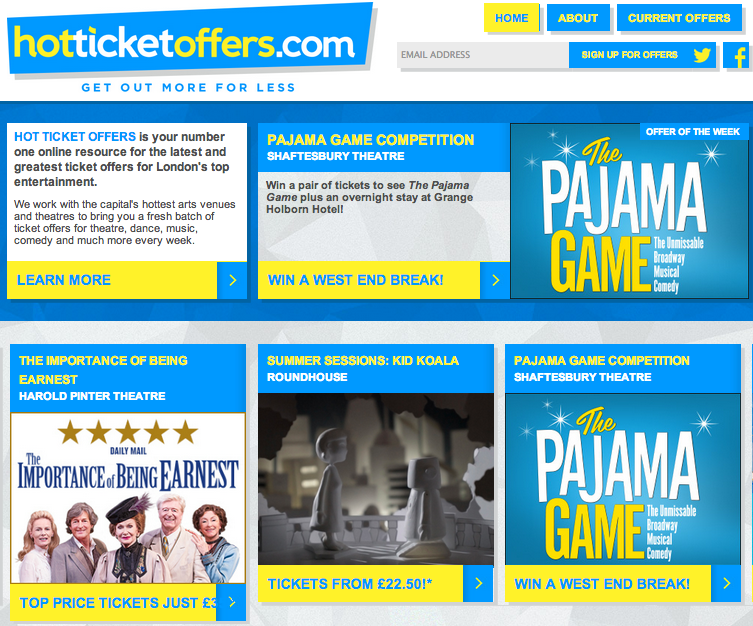 Hot Ticket Offers compiles all of London’s best offers on theatre tickets and shows. You can find the best deals and prices on musicals, West End shows, and pretty much anything with a stage. With their simple system of listing all the best deals for you to find, all you need to do is quote them upon purchase to save your precious cash. Unfortunately, however, you’ll have to keep searching to find something suits you. Without a search bar or filter option, that perfect show will just have to be found the old fashioned way. Tickets from as cheap as £3! Booking is done externally either online or over the phone – all you have to do is quote Hot Ticket Offers to get the discount, it’s as simple as that! Offers updated every week, so keep your eyes peeled! Hot Ticket Offers is ideal for those looking for a show in London while wanting to save a few pennies. With discounts on a variety of different performances, you’ll be sure to find something for you. Although they provide deals on a range of shows, Hot Ticket Offers is better for the spontaneous ones who don’t mind what they go to see – if you’re looking for something specific, keep those fingers crossed. Check out the Daily Offers and Deals page for more of the best sites offering you tonnes of savings.